Adeleke B. S.*, Olaniyi O. O. and Akinyele B. J. Department of Microbiology, Federal University of Technology, P. M. B. 704, Akure, Ondo State, Nigeria. *To whom correspondence should be addressed. E-mail: microbade@yahoo.com. Received 23 November, 2016; Received in revised form 3 January, 2017; Accepted 9 January, 2017. Bacterial isolates, Cassava peels, Linamarase production, Food industry. This study was aimed at isolating bacteria associated with fermented cassava peels as well as screening the isolated bacteria for linamarase production. Primary screening for linamarase production by bacterial isolates was determined on modified de Mann Rogosa and Sharpe agar (MRS). Bacteria were isolated on MRS incubated at room temperature for 72 h and identified by standard microbiological methods. Screening of bacteria for linamarase activity was determined on MRS medium inside the test tube while the enzyme activities were determined spectrophotometrically. Six of the bacteria isolated from the fermented cassava peels were identified as Lactobacillus plantarum, Bacillus subtilis, Bacillus megatarum, Lactobacillus fermentum, Lactobacillus bulgaricus, Lactobacillus casei and Lactobacillus delbrueckii. The screened bacteria produced linamarase on MRS containing paranitrophenyl β-D glucosides (1%) indicated by development of black spot around the perimeter on injection. The bacterial isolates were grown under different cultural conditions for linamarase production. The highest linamarase activities observed was 94.01 U/ml from L. plantarum. Linamarase activities observed were between 8.01 and 94.01 U/ml, respectively. The optimum pH and temperature for linamarase production was obtained at 45°C and pH 7.0 while the optimum inoculum concentration was at 0.8%, respectively. 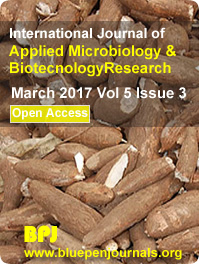 This study shows the ability of bacterial isolates (from cassava peel) to produce linamarase that can be explored in food industry.